I’m stretching back in time to a place where snacks are of the essence. Let’s face it: India does great snacks. Some of the world’s best popcorn is to be found on Indian streets. Crisp and lightly salted, a hint of masala, a dusting of asafoetida (don’t be deterred by the stink; just a pinch will add flavor and fight flatulence). And then, of course, there is bhel puri. Beautiful, oniony, tangy bhel puri. Here, a man named Parmatma Prasad stands at the entrance to Darjeeling’s Tibetan Refugee Self Help Centre, with Kangchendzonga to his back. 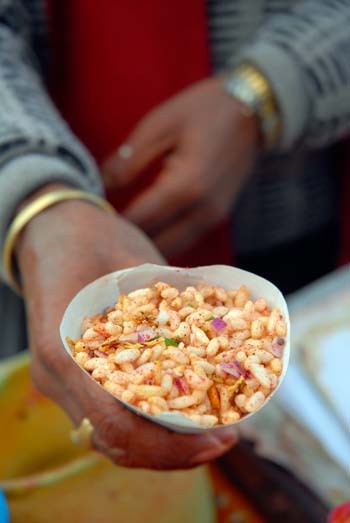 He beckons with his bhel puri, which are very special concoctions of puffed rice, indeed. 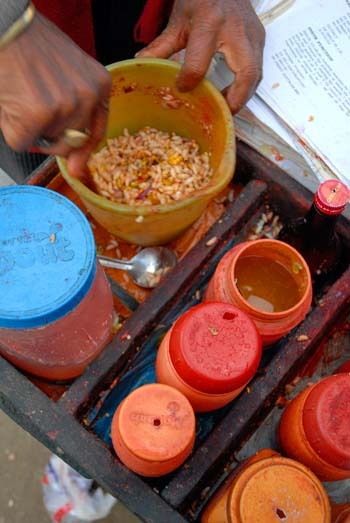 “Very good taste,” he tells us over and over again as he shovels more fresh chile, more red onion, more chopped lime and salt and pepper and cracked chana crackers and crunched-up Job’s tears and a dash of mustard oil into a paper cone (recycled, with a student’s math exam on the back). “Very good taste,” he says. Five rupees. We eat. We agree. Very good taste, for sure. So he makes another creation, a different bhel puri with more crackers, more tang. “Very good taste,” he smiles again. And I wonder if I could somehow persuade Mr. Prasad to leave his mountain perch to follow me on my travels, shoving little cones of bhel puri into my hands, everywhere I go. I love those kinds of snacks; salty & spicy. Great photos! Thanks! Need a photographer for your next book?